← Would the mystery gift-giver please drop me a line. Recently, two of my good friends married each other. Since I was responsible for the introduction, I took photos of the ceremony. I also wanted to come up with memorable wedding presents that would still be in use years later. I found a suitable rifle for the groom…picking the right present for the bride was harder. I considered lace but wasn’t sure that was her style. Latex was right out, as fitting would have been required and the element of surprise would have been lost. So leather was the next obvious choice. Trouble is, the girl is perverted enough to carry a .22 pistol. What kind of concealment leather could be found for a Mosquito? Not much, I can tell you that. Fortunately, I knew a guy named Erik. Yes, that Erik of Sideguard Holsters. Even without a Mosquito in hand, he managed to make a holster that was a perfect fit. And, to top it off, he made a low profile IWB mag pouch. Carrying a .22 makes spare magazine pretty much mandatory. At least with CCI .22s misfires seem nonexistent, so that concern typical of rimfire ammunition isn’t a factor. 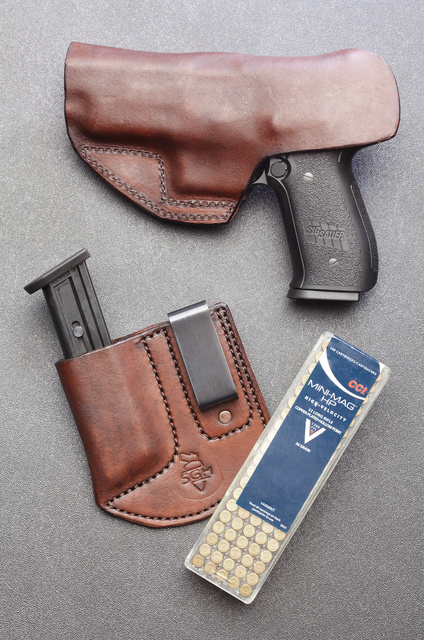 This entry was posted in ammunition, holster, self-defense and tagged 22LR, leather. Bookmark the permalink. Hey, better she carries a .22lr than nothing but harsh language! I’ll bet she’s good with it, too. Nice rig, sir. 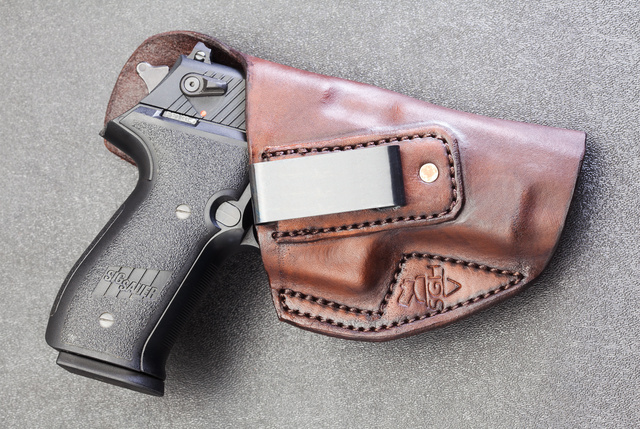 I purchased a holster from Erik for a S&W 469. I definitely plan to order more from him in the future! Talented leather workers are wonderful! Wouldn’t a say a re-finished Beretta 71 be more appropriate? This one seems big enough to use ammo that hasn’t ever been classified as ‘less than lethal’.. In fact, apart from color, nicer trim looks almost exactly like a 226..
You should have got her a .22 that actually works. Mosquito’s are among the worst guns on the market. I know at least 2 gun stores that will not order them. It’s what she selected and I am not going to override such a personal choice. You forgot to invite sean. OLEG… I’m not a fan of Mosquitos either & if the young lady opts for something that works, the new Walther PPK/S in .22LR might be a better choice! BTW: I just bought one & noticed that the barrel is sleeved exactly like a Walther PP22. Tactical Innovation’s PP22 threaded barrel adapters for muzzle accessories (1/2-28tpiRH) thread right on! My PPK/S is now a superb platform for my SWR Spectre. It’s a good deal more compact & reliable than the Sig for about $400. I’ll be damned – there really is .22 rimfire ammo available out there! What’s her rational behind carrying a Mosquito? I get PMR-30 but the Mosquito has the same if not more reliability problems without the PMR-30’s exceptional capacity so what gives? With the right ammo, with the right spring in place, and with a break-in period, the ‘Skeeter is not as bad as legend would have it. It would not be my choice but ours plays nice with CCI High Velocity. We used it as a malfunction trainer, deliberately feeding it ammo with known issues. Eventually it fed that stuff pretty well too. My Mosquito has been fine, outside of a few issues with _really_ crappy ammo (Golden Bullet. it’s garbage, but it was cheap and runs fine in my Browning Semi-Auto 22.) during the break-in period. lightly lubing the cases made a huge difference when it was new, but now I just pour in some boolits and shoot it. The Walther .22 mentioned above is also a jam queen. Also as mentioned above, a diet of match or hunting ammo will result in a really nice little shooter. It just rubs us all the wrong way to pay a lot for .22 ammo! 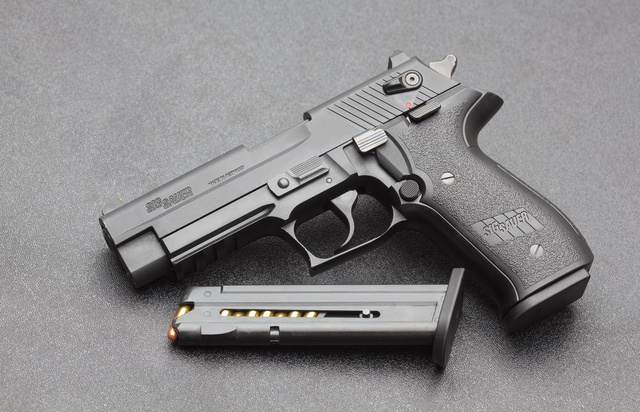 P22 isn’t exactly durable but mine has been extremely reliable with a wide variety of ammo. So I am not sure that reputation always equals reality.